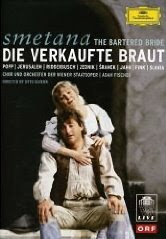 Die Verkaufte Braut or The Bartered Bride by Bedrich Smetana, as it is known in English, is probably performed more in German than in its native Czech. The Viennese love it. Odd as this may sound at my age, I am trying to question my own assumptions. Lucia Popp should be perfect for Maria, I thought. I will hear her in a role that should completely suit her, I thought, before I decide she is a total loss. Well, I never thought she was a total loss exactly, just not one of the 20 best sopranos of all time. To make the top 20, in my view, you must have shaken me to the socks at least once. Do one thing perfectly and you're in. Schwarzkopf makes my list by default because of her Marschallin. Price is in for Aida. Lots of people make it in for Wagner, since he is so difficult: Nilsson and Flagstad most notably. Callas is in for Norma. De los Angeles is in for La Boheme. Kiri te Kanawa makes my list for doing the perfect Rosalinde, a personal favorite. I hated Popp's Rosalinde. She completely misses the sophistication the role requires. Lucia Popp unquestionably does a perfect Marie in Verkaufte Braut. She grasps the music and presents the full range of emotions required for the role. She looks just right and feels right. Her German is beautiful. Is this enough to thrust her into the top ranks? Not for me, but it does bring her up out of the non-entity category. This DVD is the Deutsche Grammophon version from the Vienna State Opera with Adam Fischer conducting--a little briskly for my taste, but maybe he's right. The rest of of the cast are excellent. If you like this style of opera, it's a good choice.